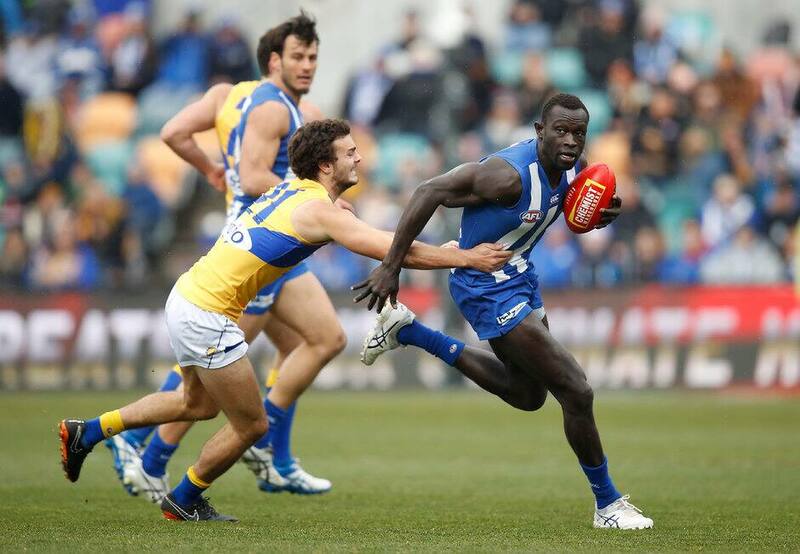 CHANGES to North Melbourne's personnel is unlikely to see Majak Daw move out of defence in 2019. The 27-year-old was a revelation in the backline, managing 18 senior games last season. But despite the retirement of tall forward Jarrad Waite, Ben Brown, the Roos' leading goalkicker from 2018, does not believe the versatile Daw will be joining him in the front six next year. "I think he (Daw) was fantastic this year for us," Brown told reporters during the week. "It a testament to the work that he's put in, being a newcomer to football when he was starting pretty late on compared to the rest of us that have come through the system. "I think it is really great that he's been able to find his niche in the side and I think we can expect that to continue, hopefully. "I think there's a big tick for the coaches as well because to put 'Maj' as a key defender, I don't know whether I would have necessarily made that move or thought to make that move. "I think last year was a product of what we're building towards as a club, but it was also a couple of really nifty coaching moves as well, so I think credit has to go to the coaches." Brown said the incoming rules changes would be a focus of pre-season preparations. "It definitely changes it as far as the work load's concerned, and we'll work really hard, especially the key forwards and the key defenders," Brown said. "We'll do a little bit of work on the hands in the back rule and how that's changed. "It (the changes to the rules) is really exciting. I think that's part of being an AFL player is that you do have to get used to changes in the rules as they come along." Star wingman Jared Polec will be the major addition to the Kangaroos' line-up in 2019. The Roos enjoyed a successful NAB AFL Trade Period where they required Polec, running defender Jasper Pittard (also from the Power), Gold Coast's Aaron Hall and Melbourne's Dom Tyson. North Melbourne will open its JLT Community Series with a game against St Kilda at Werribee's Avalon Airport Oval on Saturday, March 2.